Recently 6 motor fusion splicer has become a trend for choosing a splicer, but not many people understand the real difference between 6 motor and 4 motors splicers. Normally people would consider 4 motor splicer as cladding alignment, and 6 motor splicer as core alignment, but is it true ? Fujikura, sumitom and Fitel fusion splicer have adapted 6 motors long time ago, but until recently all the other manufactures starts to paying attention on the 6 motor splicer. Without a question that 6 motor splicer is more sophisticated than 4 motors, because 6 motor splicer has one great advantage which is the "fiber AUTO ID"
6 motor splicer is composed by 2 driving motors , 2 aligning motors and 2 focusing motors, 4 motor splicer has only 2 driving motors and 2 aligning motors. The extra 2 focusing motors are installed on the optical lens, the motors will change the distance between the fiber and lens to make different image focusing. Once the fiber is placed, the motor will drive the lens closer or further away from the fiber so the fiber image will be displayed differently on the monitor, the software will process the image and auto ID the fiber type, for instance , users put SM fiber on the left holder of splicer, MM fiber on the right holder, after closing the cover , the auto focusing kicks in , based the reflection ratio the preset software will identifier the fiber type, splicer will give the warning that there are 2 different fiber about to make a fusion , then the users will understand maybe they are putting the wrong fiber, so they can change the fiber to SM-SM or MM-MM, it definitely helps the beginners to do the right fusion. But it doesn't mean that the 4 motor splicer is cladding, it is still based the fundamental 3 axis , PAS alignment technology, only without the auto fiber ID function. Not to mention that 4 motor splicers are simpler in structure, less malfunction ,easy for repair and maintenance. But what about the accuracy ? fiber core alignment is based on clear identification of fiber core and fiber clad, if the fiber core can't be cleared distinguished by splicer how accurate it can be ? Besides the auto ID function , 6 motor splicer does has more advantages, fiber core can be better identified which means more accurate. 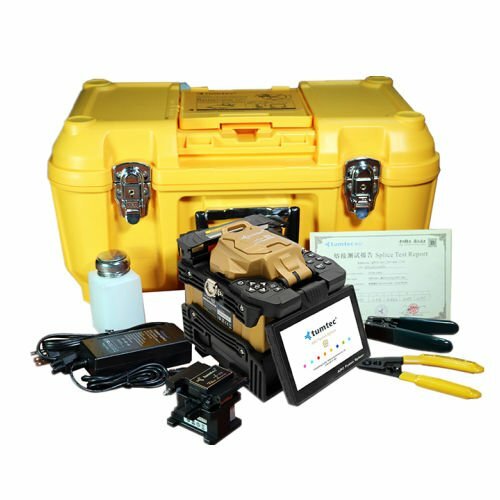 Tumetec V9 is the first 6 motor fusion splicer made in China, it is core-core, AUTO fiber ID, it comes with a high resolution touch screen, also duel core industrial processor which enable the start up less than 3 seconds. Quality is solid and performance is very positive as well. Not to mention that the price is attractive. So for those who need low budget high performance 6 motor splicers , V9 could be a nice option.